Milk chocolate egg containing Aero® milk chocolate bubbles (milk chocolates with an aerated centre). Enjoying chocolate as part of a varied, balanced diet and a healthy lifestyle, is one of life's little pleasures. 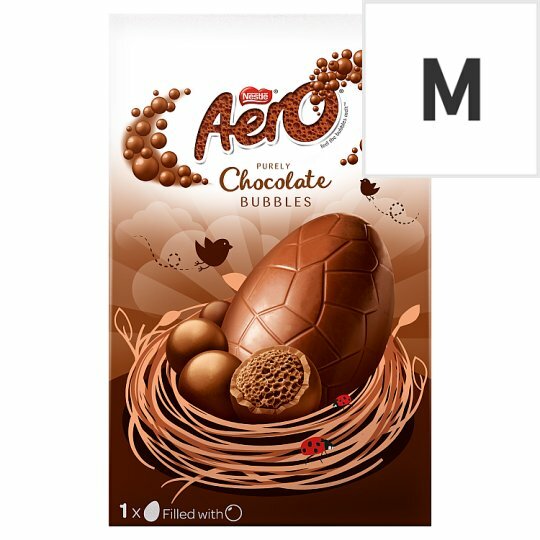 AERO Bubbles Medium Egg is a smooth creamy milk chocolate egg filled with uplifting little balls of milk chocolate AERO Bubbles inside. What makes AERO so deliciously special? It's the chocolate bubbles that are designed to melt effortlessly in your mouth. AERO is a much-loved chocolate worldwide and is renowned for its unique bubbly texture. In 1935, Rowntree's launched AERO Mint into the UK, followed by the milk chocolate variation in the 1970s. During the First and Second World Wars, Rowntree's was unable to produce pure milk chocolate bars due to the rationing of milk, and so the production of AERO came to a temporary halt. However, AERO was re-introduced in 1950 and first featured on TV in 1955, with the caption ‘The milk chocolate that's different'. As AERO continued to thrive, new flavour variations and chocolate formats were launched, including AERO Lime, AERO Coffee, AERO Caramel, and most famously AERO Bubbles in 2005. AERO's biggest launch of recent history is AERO Mousse - bubbly milk chocolate topped with a velvety layer of mousse, all wrapped up in a smooth chocolate shell. With thousands of products still being produced every day, AERO continues to delight consumers with its light, bubbly chocolate. Like Aero? Have you tried our Aero Collection Egg? Share or save your chocolate egg! Every care is taken to ensure that this product reaches you in good condition. If it does not, please return the pack and its contents to the Consumer Services Manager at the York address stating when and where it was purchased. We shall be pleased to reimburse your purchase and postage costs. This guarantee applies to the UK and ROI only. Your statutory rights are not affected.